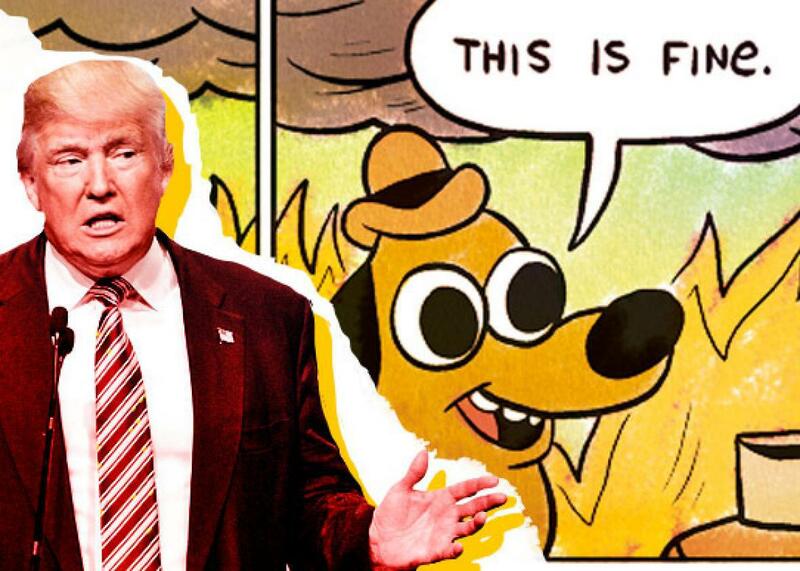 How the GOP ruined “This is fine” dog. The story of “This is fine” dog. The scholars of internet culture at Know Your Meme trace the image’s spread back to September 2014, when it first appeared without attribution and accompanied by the caption “Basically how I’m handling life right now” on Reddit and Imgur. The GOP did not respond to a request for comment about how it sourced the image, but it’s likely that someone from the party found it elsewhere on the internet much later. In his conversation with Plante, Green says he first noticed it in the wild “somewhere on Twitter or Facebook” where it had been deployed in the service of complaining about final exams. It soon found its away elsewhere, and eventually showed up in an animated Adult Swim bumper on which Green collaborated. Over email, Green told me he thinks the image’s current popularity is a barometer of current trends, an indication that we’re in “an intense clown show of a year.” He suggested, however, that it generally has a more positive valence, even when it acknowledges that everything’s the worst. “Someone online compared it to the ‘keep on truckin’ [cartoons] of the ’60[s] or ’70s from R. Crumb, where even if you don’t care for, agree with, or even know who Crumb is, you can feel the need to just keep on and doin’ your best in a crazy year of awful things,” he wrote. The connection to the vulgar and controversial underground cartoonist Robert Crumb—whose stylistic DNA is sometimes evident in Green’s work—is apt in other ways as well. The Crumb illustration Green references achieved widespread purchase outside of the comic in which it first appeared. Subjected to a cultural life all its own, it inspired assorted intellectual property lawsuits and other legal wrangling over taxes. Where these experiences were ongoing frustrations for Crumb, however, Green takes a more fatalistic attitude toward them. He told me he doesn’t expect payment for it, even if he appreciates proper attribution, “as that helps me gain readers to my actual work in comics.” Though he sells merchandise inspired by the comic, he says he has not sought viral fame. “I’ve [had] several of my images becomes memes without my help and I’ve just learned to accept that,” he wrote. Still, Green seems frustrated by the GOP’s use of his work: “My direct response is for them to please not use it.” In a tweet replying to the GOP’s initial message, TopatoCo, which handle’s Green’s online sales, wrote, “please know that the artist is fervently against all that you support.” Green, for his own part, expressed his pique on the platform, observing that he “personally would like @GOP to delete their stupid post” and later concluding “the gop account can eat me.” But Green doesn’t think he’d have any legal standing to make them stop. This irritation aside, Green mostly seems tired of the phenomenon—and his exhaustion apparently stretches back to before the current hullabaloo. “I get it’s a joke, but I guess I don’t like that joke anymore,” he wrote, adding that he dislikes how the meme’s fans exploit its broad appeal to suggest that their individual complaints are universal. Nevertheless, he’s still found ways to leverage “On Fire” to his own ends, perhaps most notably in a variant that he recently drew for political comics site the Nib that replaces his famous melting dog with the GOP’s iconic elephant, a sketch he created in advance of the present controversy. Given his frustration with the phenomenon, the GOP may have done Green a favor since it likely killed off the meme by jumping on board—or at least initiated its death spiral. The GOP is hardly the first political authority to take up a social media shibboleth for ideological purposes, and past examples suggest that such efforts almost invariably end in embarrassment: Hillary Clinton’s social team tried to prove its candidate was one of the kids when it tweeted “Delete your account” in response to an ornery Donald Trump post. More recently, Bernie Sanders inspired a condescending Vox explainer when someone attempted a similar jape from his account. These attempts to politicize internet culture don’t just fail because they’re inauthentic. The trouble with such tweets—whether they’re coming from left or right—is that they’re mostly going to make sense to people who will discard them as soon as they spread too far. Merely by helping bring these phenomena into the mainstream, politicians decrease the cultural purchase. Those past fumbles—and the GOP’s present one—point to an important point, then, one that builds on the insights of other explorations of meme culture: Uncoolness is contagious. In other words, “this is fine” dog might not be on fire anymore.